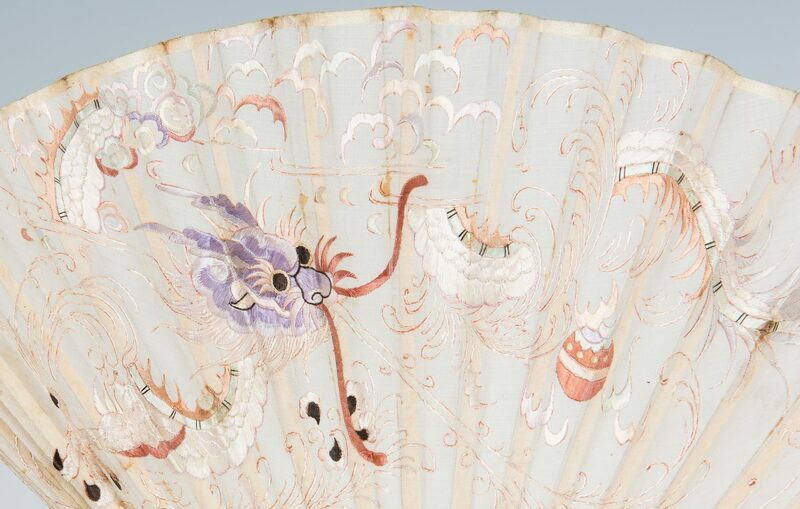 Three (3) Chinese or Japanese lacquer fan boxes with three (3) fans. 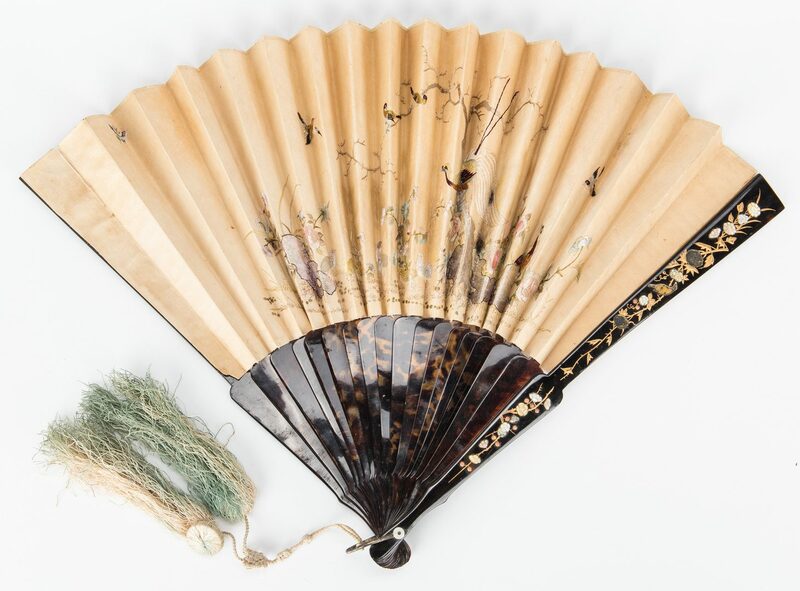 1st and 2nd items: Silk fan embroidered with decoration of a bird of paradise in a landscape; faux tortoise sticks, guards inlaid with gilt, mother of pearl and coral bird and flower decoration. 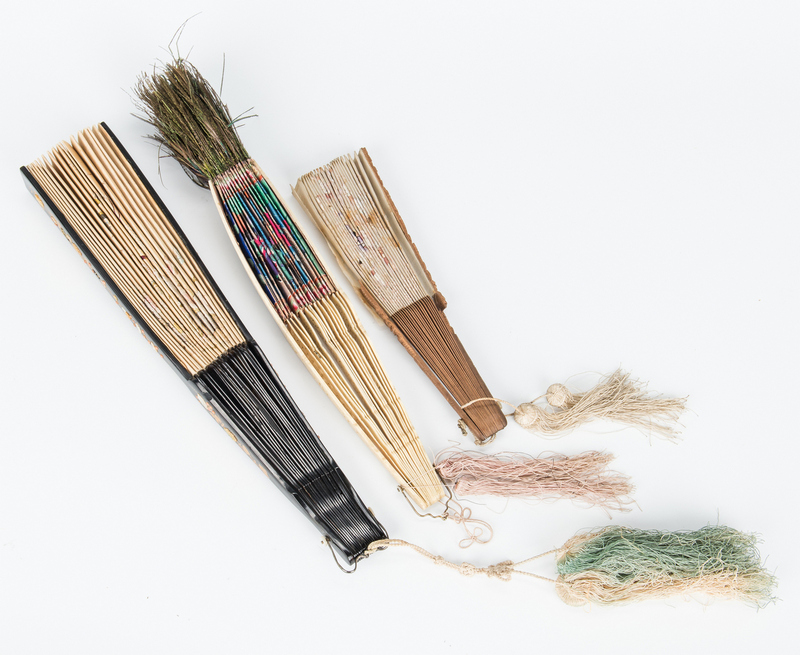 Old silk tassel. 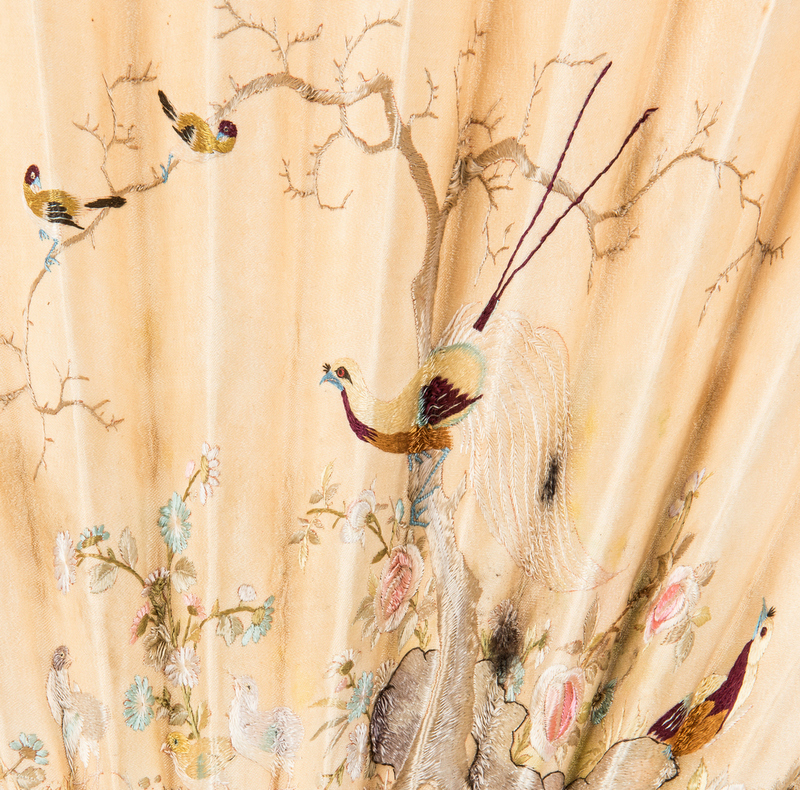 Housed in a silk lined fitted lacquer box with gilded feather trim decoration to top and line decoration to sides. 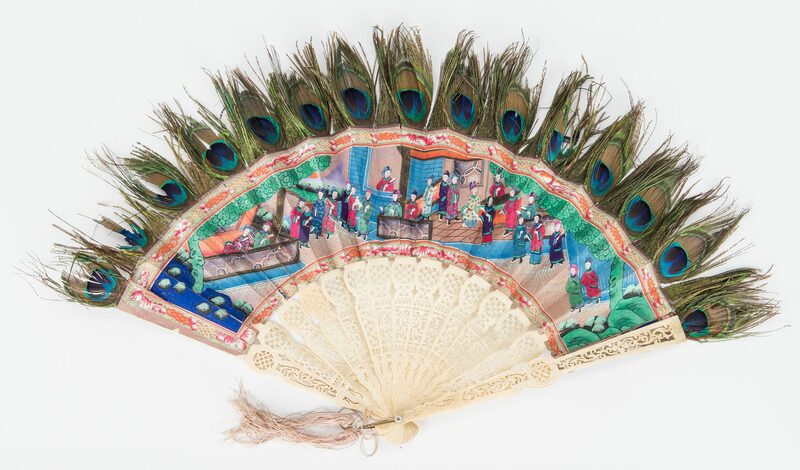 Fan – 13 1/2"L, 21 1/2" W extended; Box – 16 1/2" L. 3rd and 4th items: Silk fan with peacock feathers and painted decoration of figures at court; pierced bone sticks and gards, silk tassels. 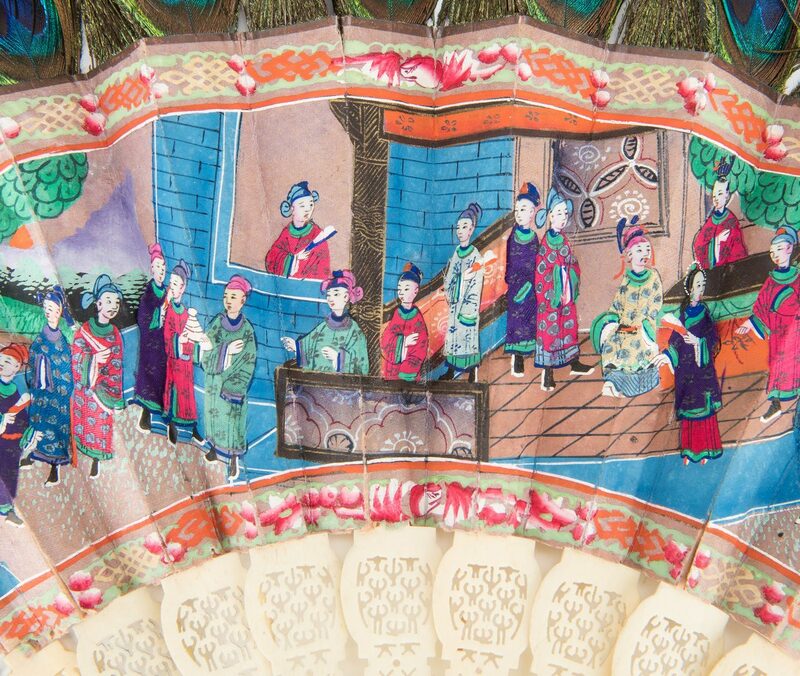 Housed in a lacquer box with gilt scene of figures in landscape and a wallpaper lined interior. 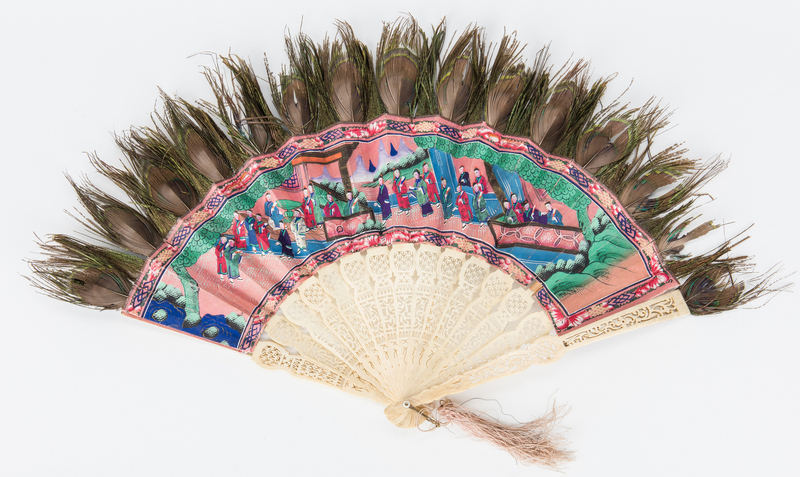 Fan – 13" L x 21" W extended (tips of feathers); Box – 15" L. 5th and 6th items: Silk fan embroidered with dragon scene, carved boxwood sticks and guards. 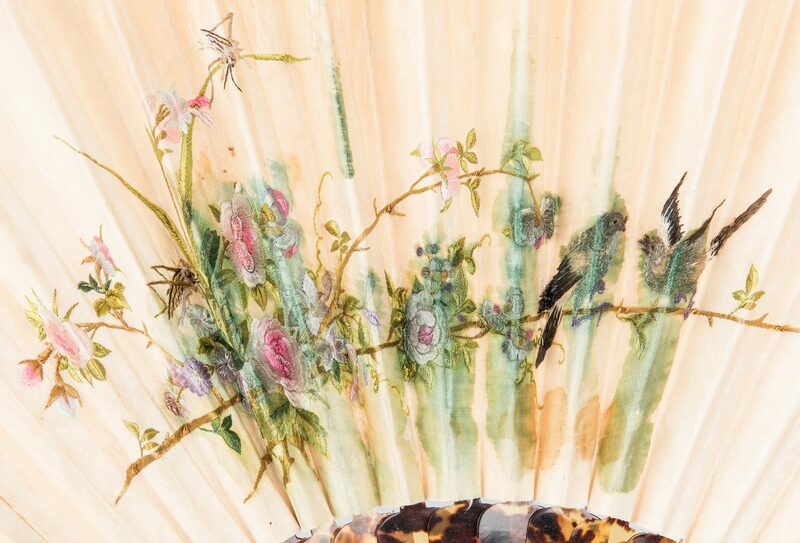 Housed in a lacquer box with gilt floral decoration; interior of lid has hand painted scene of bird in landscape. 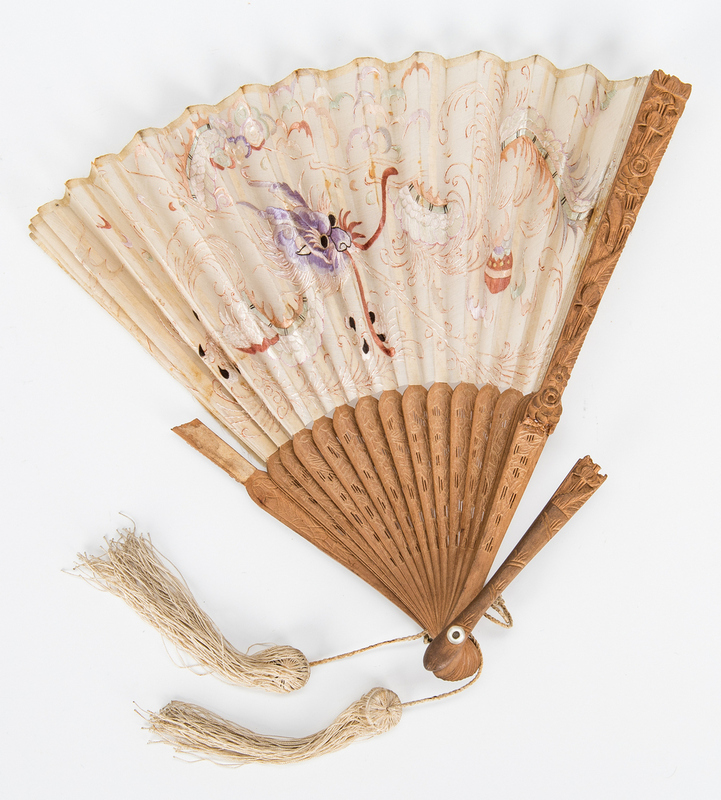 Fan – 9" L; Box – 10 1/4" L. All late 19th to mid 20th century. 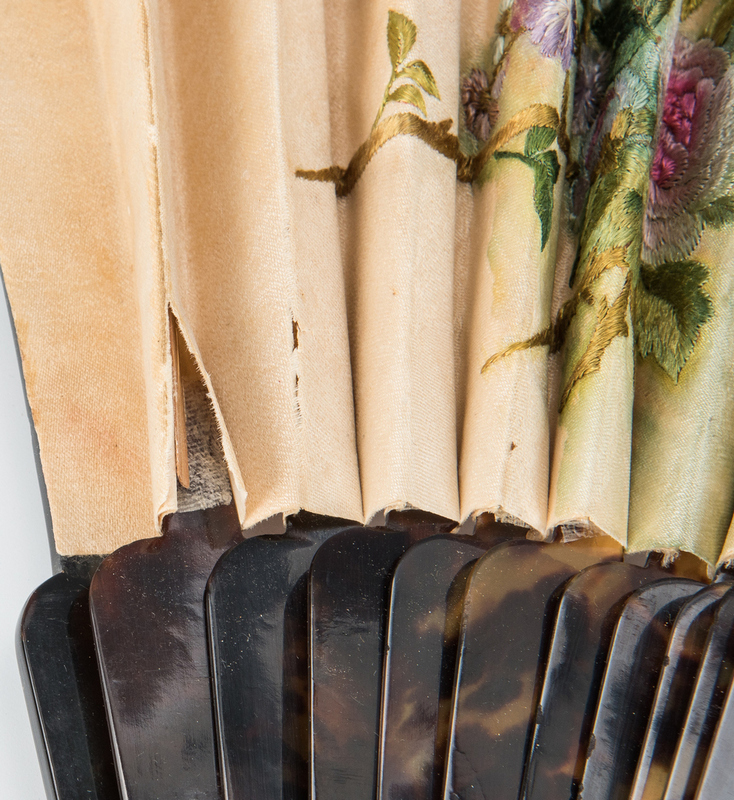 CONDITION: 1st and 2nd items: Two flower inlay pieces missing from each guard, color runs to reverse side; general wear, light discloration and fading, silk tassle tangled and worn. 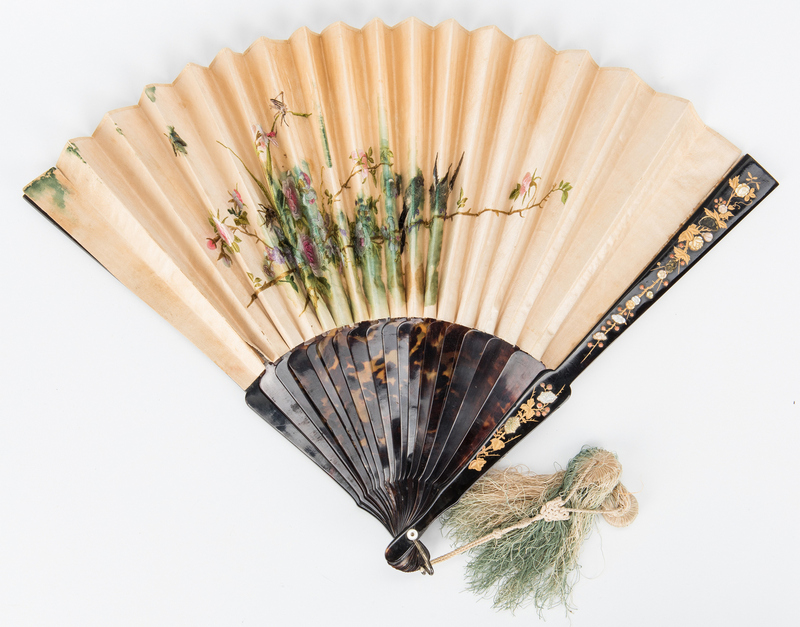 Fan in overall good condition. 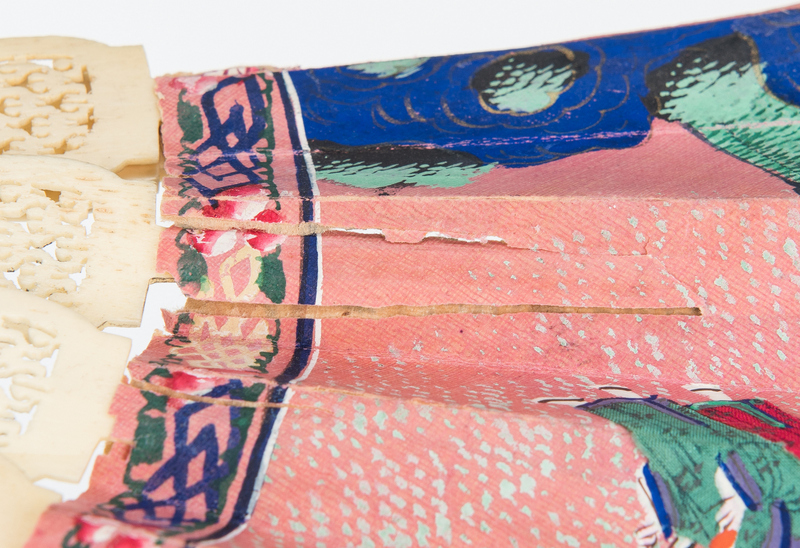 Box overall fair condition with wear, small losses and cracks. Hinges broken. 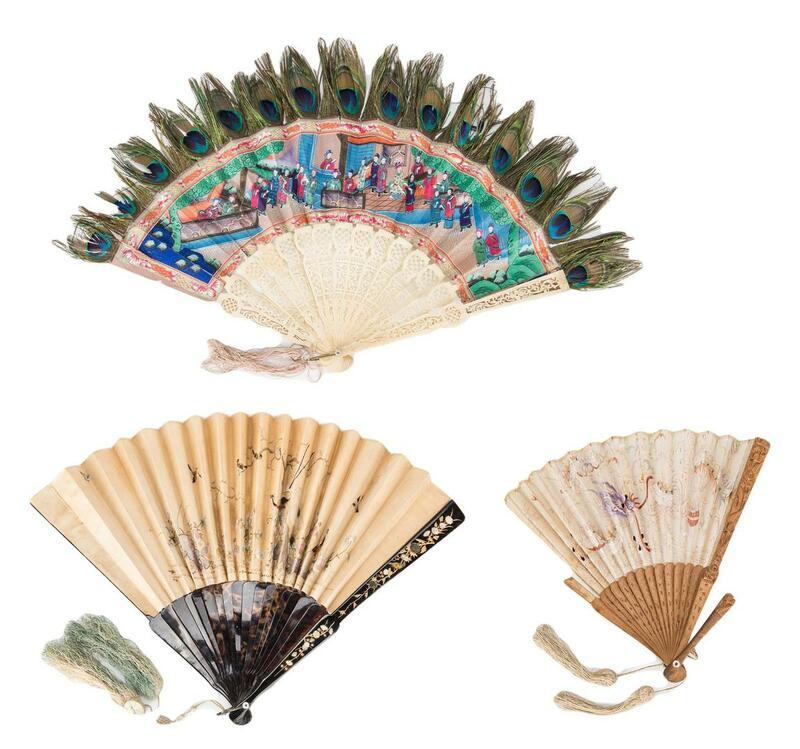 3rd and 4th items: Wear and some small losses to feathers, some small tears and losses to painted scene but overall good condition; guards somewhat curved/warped; box with chipping and some cracks, overall good condition. 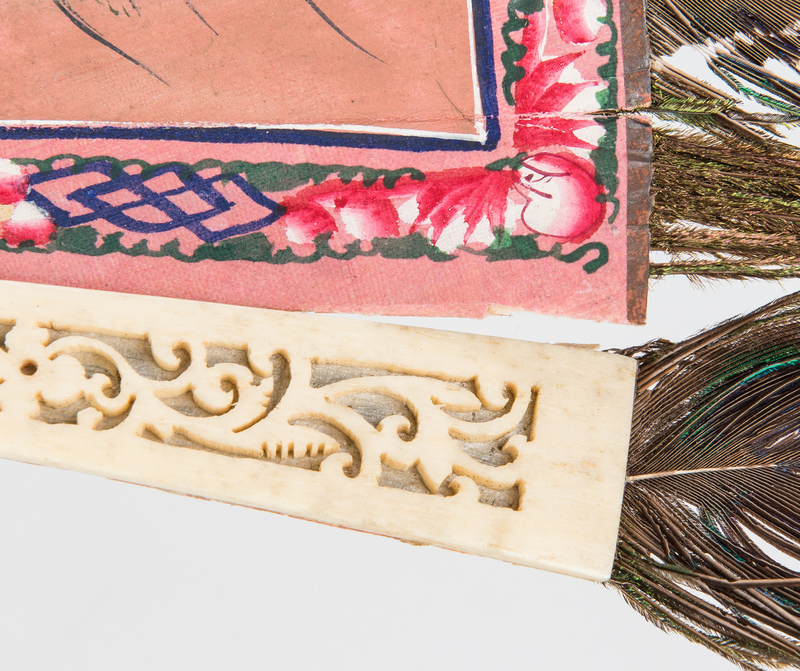 5th and 6th items: Overall fair condition with guards broken, tears to silk at ends; tears to bird illustration inside box lid, chipping to exterior of box. Hinges broken.